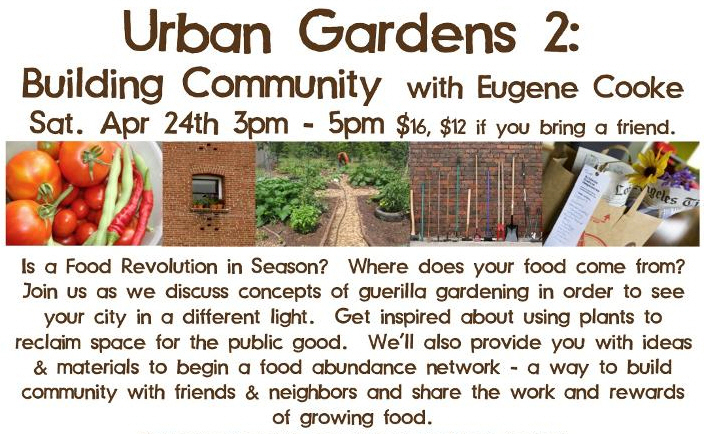 Join us at the Jerome CommUnity Learning Center as Eugene Cooke discusses concepts of guerilla food growing and community building in order to see your urban city in a different light. Get inspired about using plants to reclaim space for the public good. We’ll provide you with ideas & materials to begin a food abundance network – a way to build community with friends & neighbors and share the work and rewards of growing food. Please visit http://theinsideout.biz/garden.html for more information and please forward this to anyone who might be interested. Bring a hat – we’ll be outside! at the Jerome CommUnity Learning Garden (located at the Southeast of Jerome Park) 2115 W. McFadden Santa Ana 92704. Space is limited. Pre-registration a must. RSVP theinsideoutyoga@gmail.com.